This condo is right off the meadow! Walk right out into mother nature! Character-rich and colorful, this blast from the past has its own unique style. This one bedroom condo has everything you need for a cross-country ski-in ski-out vacation, and is perfect for a small family or couple. The back porch leads directly out to the cross-country trails that traverse picturesque Kirkwood Meadow. Base Camp was the first building complex to offer condominiums at the base of the mountain in 1972 and remains one of the most convenient settings to call home. Wood burning stoves and generously sized decks and porches combine homey mountain comfort with a sense of being in nature. You won’t find elevators and heated sidewalks here, but you will find relaxation, quality family time, and a great bang for your buck. Base camp takes you back to the basics of ski resort lodging and only footsteps away from 5 ski lifts, 2 restaurants, shuttle stops, shopping, and the cross country trails, this complex is one of the most conveniently located within the Kirkwood valley. 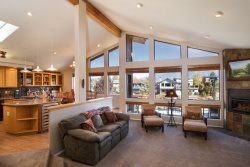 Many families choose these residences for their laid-back ambiance and family friendly snow play areas. A coin operated washer and dryer are also available.